Here are some of the frequently asked questions about Display Assistant and their answers. Which versions of Microsoft Windows does Display Assistant support? Which languages does Display Assistant support? I have more than one monitor connected to my machine. But Display Assistant reports only one monitor. What could be the problem? Windows 7: Windows 7 Home Basic, Windows 7 Starter. Windows Vista: Windows Vista Home Basic. Display Assistant is available in the following languages: English, French, German, Dutch, Japanese. The translations from English are done with help from Google Translator and Microsoft Translator. Since these are machine translators, there could be some incorrect translations. Please email OfficeOne in case you find an incorrect translation or if you have a better translation. Technical support for Display Assistant is available in English only. Its actually Windows that it seeing only one monitor! There are a couple of possibilities that could be causing the problem. Go to Display Properties dialog box by selecting Start | Settings | Control Panel menu item and launching Displayapplet. 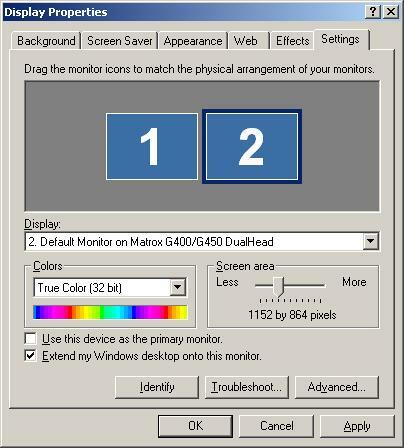 Click on monitor 2 and check against the Extend my Windows desktop onto this monitor check box as shown below. The display isn't configured for true multi-monitor mode. Visit here to configure your machine for true multi-monitor mode. A detailed discussion on true multi-monitor mode is available here. How do I display multiple slide shows with Matrox DualHead2Go? How do I display multiple slide shows synchronous with each other using Matrox DualHead2Go?